"Moroccanoil Intense Hydrating Mask, 16.9-Ounce Jar"
Contains linden bud extract, which absorbs into the hair to plump the cuticle from the inside out. We would love to be given the opportunity to work with you to resolve any problem you may have. Contains linden bud extract, which absorbs into the hair to plump the cuticle from the inside out. Moroccanoil Clarify Clarifying Shampoo 8.5oz - NEW!!! INTENSE HYDRATION HYDRATE. 16.9 OZ WITH PUMP. FIND THE BEST DEALS HERE ALL YEAR LONG! Leave on for 1–2 minutes and rinse well. Infused with antioxidant-rich argan oil and fortifying nutrients, including linden bud extract, this volumizing conditioner transforms hair from lifeless to lively. Trending at $17.78eBay determines this price through a machine learned model of the product's sale prices within the last 90 days. Oz (250ml). Gentle enough for daily use, it provides optimal hydration for both normal and color-treated hair. Rinse thoroughly until water runs clear. Infused with replenishing nutrients including antioxidant-rich argan oil, Vitamins A and E and red algae for optimal hydration and conditioning. MOROCCANOIL® SMOOTH Conditioner Smoothing Straightening 8.5 fl oz FAST SHIPPING! Condition, detangle and smooth unruly or frizzy hair with Moroccanoil Smoothing Conditioner. Enriched with antioxidant argan oil and argan butter to instantly nourish and deeply hydrate hair, leaving it smooth, manageable and healthy-looking. 5 out of 5 stars - MOROCCANOIL® SMOOTH Conditioner Smoothing Straightening 8.5 fl oz FAST SHIPPING! 1 product rating1 product ratings - MOROCCANOIL® SMOOTH Conditioner Smoothing Straightening 8.5 fl oz FAST SHIPPING! Moroccanoil Hydrating Shampoo 33.8 oz 1 L.
Q: What is the difference between the three products in the Moroccanoil® Hair Mask Collection?. It deeply hydrates and conditions, while improving texture and manageability. Moroccanoil Weightless Mask is for fine, dry hair. Gentle enough for daily use, it provides optimal hydration for both normal and color-treated hair. Rinse thoroughly until water runs clear. How to use. We are very serious against false claims. Any attempts with intend to manipulate our system will result in appropriate repercussions. No exceptions. (excludes samples). Daily replenishing formula is infused with antioxidant-rich argan oil, Vitamins A and E and red algae. Suited for all hair types. Say goodbye to dry. Infused with antioxidant-rich argan oil to improve hair health and Vitamin A and Red Algae to combat free radicals. Increase your hair's manageability, smoothness and shine. Sulfate-free, phosphate-free and paraben-free. This gentle, daily-use formula leaves hair smoother, more manageable and easier to style. We would love to be given the opportunity to work with you to resolve any problem you may have. 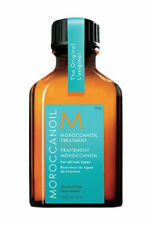 Apply after shampooing and let penetrate for 7-10 minutes, then rinse and follow with any Moroccanoil styling product. 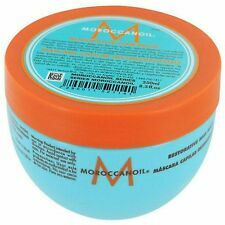 Moroccanoil Restorative Hair Mask 250ml/8.5oz. Here are a few of the benefits you'll enjoy. MOROCCANOIL MOISTURE REPAIR SHAMPOO AND CONDITIONER SET 2.4 OZ EA TRAVEL. Condition is New. Shipped with USPS First Class Package. BUY ANY 2 HAIR PRODUCTS, GET 2DAY SHIP TIMES FOR FREE. MOROCCAN HYDRATION SHAMPOO AND CONDITIONER 33.8 OZ Gentle enough for daily use. Certificates, manuals, warranty, and instruction. For all Hair type. Paraben Free. Moroccanoil Dry Shampoo Dark Tones & Light Tones 5.4 oz OR 1.7 oz - YOU CHOOSE!! Color safe, sulfate, phosphate and paraben free. Rich and luxurious, your hair will be left wonderfully soft and easy to manage. Both the shampoo and conditioner contain a blend of special ingredients that will breathe a new lease of life into your hair, leaving it healthy and exuding vitality. MOROCCANOIL® Moisture REPAIR Shampoo Color-Safe 8.5 fl oz FAST FREE SHIPPING!!! 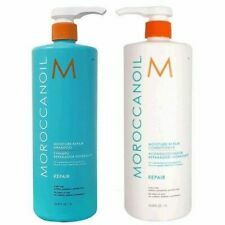 Moroccanoil Curl Cleansing Conditioner 250ml / 8.1oz Free Shipping W/Gift!